New books were published last week and others are scheduled for publication next week. Some I will read; some I will intend to read; but the vast bulk of them I’ll never manage. We know we can’t read everything, so we make choices based on mixed criteria of obligation, recreation and inquisitiveness. Every now and then a volume from the past may also catch our attention and tempt us to open it. Early this year I had such an experience. It was a mirror-within-a-mirror moment when I came upon Why Read the Classics? by Italo Calvino, a collection of essays published posthumously a generation ago in 1991. I knew of his work through Invisible Cities, Marcovaldo, Mr Palomar and On a Winter’s Night a Traveller but I hadn’t read his non-fiction. The premise looked promising, so I bought a copy. The book can be opened and begun from any chapter. Calvino praises and re-evaluates works of many a great writer: Homer, Ovid, Defoe, Voltaire, Balzac, Stendhal, Dickens, Flaubert, Tolstoy, Conrad, Pasternak, Hemingway, Borges et alios. But he lays out his definitions for what makes a classic during his introductory essay, beginning with the observation that adult readers who claim to be re-reading a classic are often reading it for the first time. Such readers, he contends, are guilty of a small act of hypocrisy (ipocrisia in the original Italian) by implying they already read the famous book when they were younger. We all have knowledge gaps in the historical-literary-critical canon, says Calvino, so why not admit it? He affirms that reading a great work for the first time as an adult can be an extraordinary pleasure, so we should celebrate these discoveries instead. Unless we’re compulsive liars or comedians or fantasists (not mutually exclusive categories), we don’t claim to be Elvis Presley in disguise or pretend we have evidence that Harold Holt was taken by a Chinese submarine. Yet I wonder how often people claim closer acquaintance with a book, film, play or concert than they have truthfully known. I imagine that the rationale would go something like this: ‘Hey, I’ve seen the movie of the book, so that counts as reading it, right?’ ‘Look, I saw the trailer, so I’ve got the gist of the film, right?’ And then a person can boast of greater erudition than he or she has earned. Now we all know that watching a two-hour movie adaptation of a five-hundred page novel does not equate to reading the book, as screenwriters must combine characters and compress scenes to fit the different art form. It’s an even riskier gambit to sample highlights from film and claim you’ve ‘seen’ it, as excerpts are seldom representative of the work as a whole. So why do people do it? Motivation for such white lies of cultural appropriation may well be a guilty response to falling short of someone else’s standards. These can be real or imagined or aspirational standards, perhaps inferred from conversations in our social or educational circles or professional environments. If so, such guilt symptoms bear more than a fleeting resemblance to fashion-victimisation and body-image shaming. ‘You haven’t seen that clip on YouTube? It’s been around for months. What planet have you been on? I’ll send you the link.’ A helpful Facebook friend then proceeds to tag you, so now the rest of your on-line friends realise you’re an out-of-touch ignoramus. And while on this roundabout of social media, we are bombarded with requests to ‘like’ a product or service. Even a seemingly benign site like Goodreads has a sweetheart deal going with Amazon, so that every ‘like’ can be a sales foot in the door. Regarding that list of books you say you’ve read, you enjoyed Agatha Christie so why not try Dorothy L Sayers or Kerry Greenwood? You enjoyed Plato so why not try Herodotus or Suetonius? Calvino never had to suffer the clicks and arrows of social media but he may be right. To extend his argument further, for some adults it may be acceptable to admit lack of acquaintance with an esoteric text like Plutarch’s Lives but it’s a bridge too far to confess they haven’t read a staple like Lord of the Flies. And why the cover-up? Maybe they were unwell during Year Nine when everyone else was forced to read it. Maybe they were bored to tears trying get through the thing under duress but now at last they’re genuinely motivated and willing to appreciate it, only they’re too ashamed to say so. This is crazy. We all know none of us can read everything. Sir Francis Bacon was the last person foolish enough to brag that he’d read all the books published. In 2015, how would any individual find world enough and time? 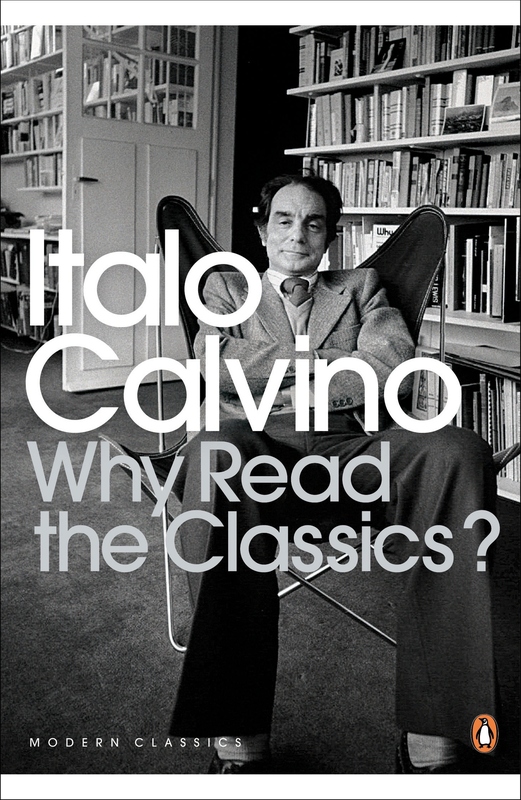 If Calvino is right and some among us are guilty of ipocrisia for pretending to re-read classics, what about those who aren’t even attempting to read but claim to have already read, lest they be branded as culturally under-qualified? Though I lack first-hand observation of Calvino’s hypocrisy charge, I have heard people say ‘I must get around to reading that’. Maybe this is a symptom of our education or maybe we feel a sense of unfinished business, playing cultural catch-up. I still read in the traditional way but nowadays I have additional opportunities. In the car I listen to actors perform audio books, so I ‘read’ some texts without touching a page. And on my morning run I listen to podcast versions. Perhaps this movement metaphor isn’t accidental in our sped-up era, yet I believe that pursuing an ideal is more important than reaching a target. Sure I can absorb one more classic but I need to keep in mind a memento mori: getting through them all ain’t gonna happen. And if I ceased trying, would it matter? When is enough? An even greater problem is finding reading time and head-space in this distraction-heavy age. Reading requires discipline. It’s not easy to jump straight into Juvenal or Thomas Aquinas or Sun Tsu. If a classic is translated into English, it will arrive from another era and another country: multiple transition. But let’s face it: on a plane trip or lounging at the beach it’s easier to sample a modern biography or a book about domestic politics than to plunge into the heavy style of Thucydides or Gibbon. Even approachable historians like Manning Clark or Barbara Tuchman require adjustment to a certain reading mood, while tackling modern fiction masters like Thomas Pynchon or David Foster Wallace requires more mental energy than most people have to spare. When commuting homewards, many of us plug into phones or thumb through less demanding reading. That volume of Dostoyevsky and Thomas Mann can wait until tomorrow. It’s waited long enough. The to-be-read shelf will never be empty, as cultural relics continue to pile up. And there’s no shame in that.